LAS VEGAS -- Promoter Bob Arum told Yahoo Sports on Tuesday that Manny Pacquiao has agreed to terms for a May 2 bout with Floyd Mayweather, and that the only thing in the way of the long-awaited fight occurring is Mayweather's approval. Arum said Mayweather's representatives have also agreed to the deal but have not been able to get Mayweather's agreement. However, there is no verification from anyone representing Mayweather whether Arum's side is accurate. On Friday, the Los Angeles Times reported that progress was being made on making the match a reality. Multiple sources told Yahoo Sports over the weekend that a deal for the two superstars to fight at the MGM Grand Garden was imminent. The sources told Yahoo Sports that not only have the sides agreed for the fight to be May 2 at the MGM, but also on a 60/40 purse split that would favor Mayweather. 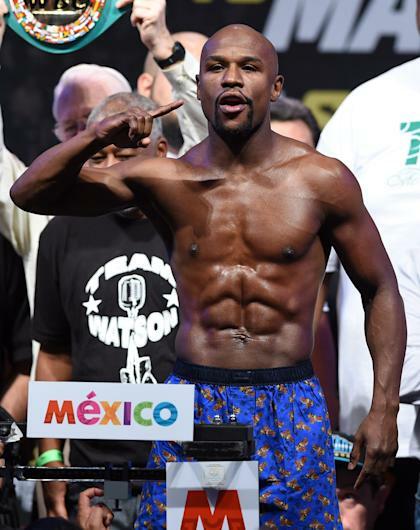 Mayweather could make in the range of $120 million. An MGM spokesman told Yahoo Sports that there was no deal for the fight to be held at the Grand Garden as far as he is aware. In order to pay the astronomical salaries the fighters will command, ticket prices will be scaled at an all-time high. The top ticket at the MGM Grand Garden is expected to go for $5,000 so that the arena can be scaled to produce a $40 million live gate. A $40 million live gate would be virtually double the existing record gate of $20,003,150, which was set at the MGM in 2013 by Mayweather and Canelo Alvarez. Arum refused Tuesday to speak about details, but said Pacquiao was on board with all terms. "I want to get some movement here, with bringing Mayweather to the table so we can go out and get everything signed and get the networks together and get the thing finished," Arum told Yahoo Sports on Tuesday. Mayweather has an exclusive contract with Showtime and Pacquiao is obligated to HBO. It is not immediately clear which network will broadcast the fight, though it is expected that both will be involved. That was the solution worked out in 2002, when Mike Tyson (Showtime) fought Lennox Lewis (HBO) in Memphis, Tenn.
A Mayweather-Pacquiao bout first began to be seriously discussed in 2009. 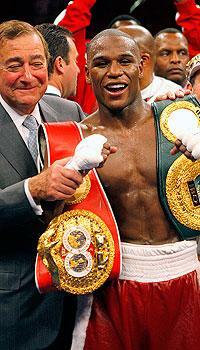 Mayweather ended a brief retirement by routing Juan Manuel Marquez at the MGM on Sept. 19, 2009. Two months later, in perhaps the defining performance of his career, Pacquiao stopped Miguel Cotto at the MGM in the 12th round on Nov. 14, 2009. It was clear at that point that they were not only the best welterweights in the world, but also the two best pound-for-pound fighters, period. While Mayweather is now widely acknowledged as the No. 1 fighter in the world, there was some debate in 2009 after Pacquiao stopped Cotto. Pacquiao was on a streak of 11 wins in a row that included dominant one-sided victories over Cotto, Oscar De La Hoya, Ricky Hatton, Marco Antonio Barrera and Erik Morales. An agreement was close in 2009 for a March 2010 bout, but it fell apart when Pacquiao declined Mayweather's last-minute demand for drug testing. Former HBO Sports president Ross Greenburg tried to mediate a deal between the sides in 2011, and talks seemed promising at one point before it lost momentum. And in 2012, Mayweather personally called Pacquiao and offered him a flat $40 million for the fight. Pacquiao declined because there was a lot more money in the fight and he wouldn't have gotten any pay-per-view revenue. Arum declined to speak on the record over the weekend when reached by Yahoo Sports to discuss the rumors circulating that the fight was on the verge of being made. But early Tuesday, he spoke to Brad Cooney of Examiner.com and told Cooney that Pacquiao had agreed to terms. In a conversation later Tuesday with Yahoo Sports, Arum was asked if he were trying to force Mayweather's hand by speaking publicly after he was so tight-lipped and adamantly refusing to comment over the weekend. "I'm not going to put a deadline on there. I'm just going to hope that everybody does the right thing and we get this concluded. It would be really sad if we went through this stuff again like we did before." Arum said he and Pacquiao were "ignorant about the drug-testing stuff," when Mayweather first made the request for testing in the 2009 negotiations. He said Pacquiao has educated himself on it and has no problem to being tested and readily agreed to testing as part of his deal in getting the Mayweather fight. He declined to talk specifics on Tuesday about purses, venue and the like, but said his only goal was to get a deal consummated. Pacquiao is flying to the U.S. on Wednesday and has meetings with Arum and then is doing publicity for a movie. Arum said he hopes to avoid getting close to a deal, getting hopes up and then having it dashed. If that's his position, it doesn't make sense to talk publicly about private negotiations, but that's always been Arum's style. "The point is that I don't want what happened the other times to happen again," Arum said. "I want this fight to actually happen. I want everybody to make a lot of money on the fight. I want the public to be satisfied. And I think it will be a terrific event. That's what I want, and I've done everything in my power to make that happen. "I think Manny has been very reasonable and demonstrated that he wants the fight to happen. Now, we're waiting on Floyd. That's not to say that Floyd has been obstinate, that Floyd won't do it, but we're waiting on him." Top Rank is also working on a middleweight title fight between Alvarez, the Golden Boy star from Mexico, and WBC champion Miguel Cotto. Promoter Oscar De La Hoya of Golden Boy is on record saying he wants Alvarez to fight on May 2, and Arum has agreed that it made sense to have Alvarez fighting on a Mexican holiday. But Arum said that if fighting on May 2 meant that much to Mayweather, he would look to make the Cotto-Alvarez fight for some other date. That fight still isn't finalized, though, and it's no guarantee that it will be.